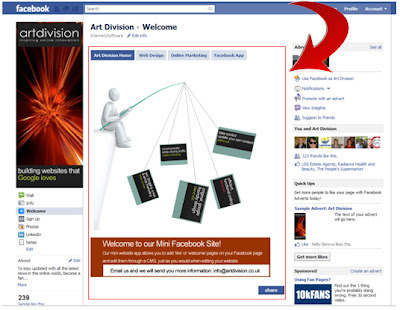 Art Division has just launched a new Facebook App. The application is designed to allow Facebook to act as your own mini website. It works as a stand alone mini website, embedded into the Facebook template. Promote your latest offers, showcase your services, add links, YouTube videos and images and present your business in manageable, bite sized chunks, which you can change through an online control panel - just as you would with your website. What you title and use each tab for is completely up to and controlled via your own CMS, meaning you can change them whenever you want. To see the App in action, go to www.facebook.com/artdivision - make sure you 'like' our page and click on the welcome tab. Once there, please click on the 'share' button and promote this App onto your wall - it will help us spread the word.